What is Vladimir Putin up to in Latin America? That question was at the center of a probing story in Americas Quarterly magazine, the independent publication of Americas Society and Council of the Americas, in response to recent moves by the Russian president to increase diplomatic and trade activities in Latin America. The magazine’s art director, Donald Partyka, turned to New York City-based illustrator Wesley Bedrosian to create a compelling piece of art conveying the point of the article. The illustration was later named a winner of the Latin American Ilustracion 4 competition. “I’m known for working in a pen-and-ink style. 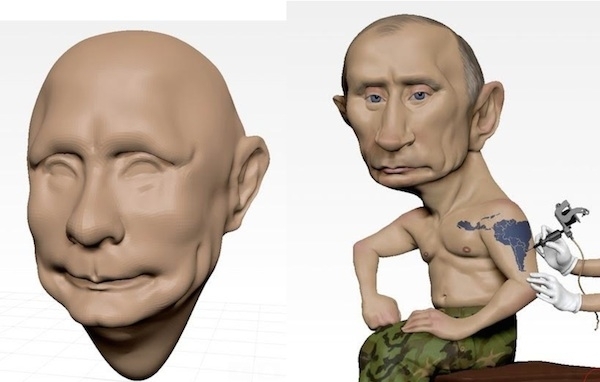 But over the past few years, I have developed an alternate 3D style that caught the eye of Partyka,” says Bedrosian. 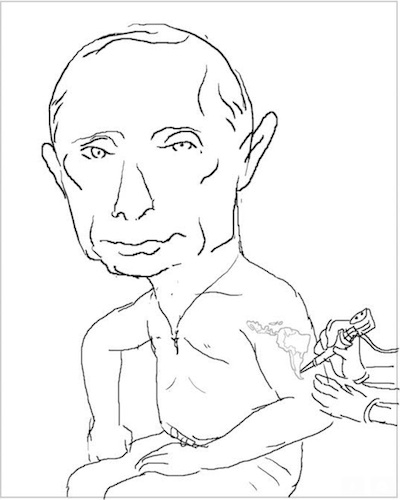 Bedrosian knew right away that he had to show Putin — who loves expose his torso in photos — in a shirtless pose. 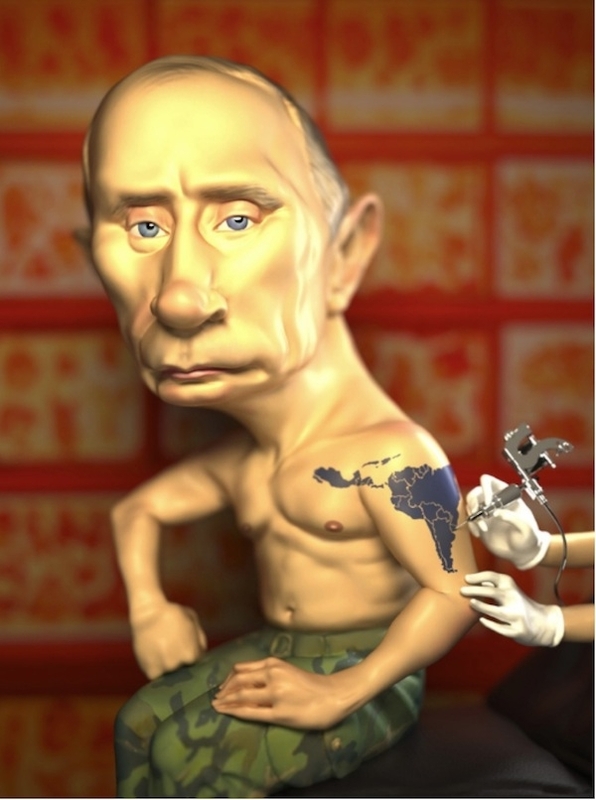 That led to the idea of giving him a tattoo that subtly questions Putin’s political intentions. Zbrush, explains Bedrosian, simulates the organic experience of working with clay. “I prefer it because it doesn’t inhibit my drawing sensibility,” he says. 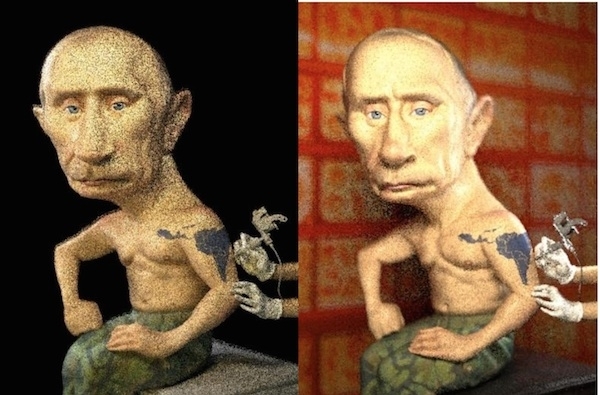 Maxwell Render is a light-simulation program used by TV and movie-production companies. Bedrosian began his career as a greeting-card artist for American Greetings, the world’s largest greeting-card company. He later studied with illustrator Marshall Arisman at the School of Visual Arts in New York. “There I found my visual voice,” he says. His work has appeared in newspapers and magazines including the New York Times, the Wall Street Journal, the Boston Globe, Scientific American, Vanity Fair, Newsweek, New York Magazine and the Hollywood Reporter.